SKOPJE—Experts explored ways to strengthen cooperation between China and Central and Eastern European Countries at a symposium in Skopje, the capital city of Macedonia in late October. 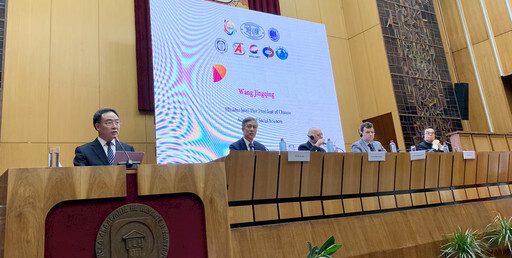 Wang Jingqing, vice president of the Chinese Academy of Social Sciences (CASS), said that as a farreaching people-to-people exchange activity between China and CEE countries, this symposium marks an important step in the implementation of the Sofia Guidelines issued in July this year. The booming “16+1” cooperation in various sectors has become a cross-regional cooperation mechanism that benefits all parties. Both China and CEE countries will continue to uphold the principles of mutual respect, win-win cooperation and common development, jointly building an open world economy and elevating economic globalization to a more dynamic, inclusive and sustainable level. Wang added that 2018 is the 40th anniversary of China’s reform and opening up, and great changes have taken place in China, which has gradually become an important engine of the world economy. Such great achievements have been made due to China’s following and seizing the historical trend of economic globalization. In today’s world, the rise of unilateralism and protectionism is damaging the recovering world economy and increasing global uncertainties. But the process of globalization will not change. Neither will China change its direction of reform. China is willing to work with the countries of Central and Eastern Europe to promote trade liberalization, combine complementary advantages, accelerate efforts for greater connectivity, and advance 16+1 cooperation to a broader and deeper level, Wang concluded. Zoran Zaev, prime minister of the Republic of Macedonia, pointed out that this year marks the 25th anniversary of the establishment of diplomatic ties between China and Macedonia. Over the past 25 years, the two sides have been committed to strengthening friendly cooperation and their relations have made substantial progress. Now they have entered the best period in history. Zaev stressed that Macedonia actively supports and participates in the 16+1 cooperation process and regards it as an important opportunity to promote the development of friendly China-Macedonia relations. This symposium, as an important step to deepen 16+1 cooperation, will effectively promote people-topeople and cultural exchanges between the two sides. At the opening ceremony, Wang, together with Taki Fiti, president of the Macedonian Academy of Sciences and Arts, signed a cooperation agreement between the two academies. The two sides will organize academic conferences on topics of common interest, carry out mutual exchanges between scholars and conduct cooperative research under the framework of the agreement.